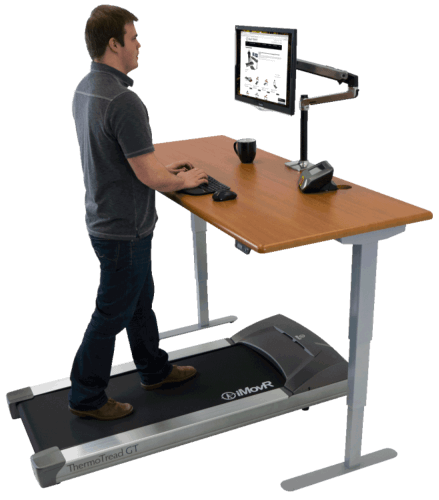 Explore a complete treadmill desk system from iMovR. Fully customize your workstation with an assortment of shapes, sizes, colors, and accessories to choose from. Our proprietary walking treadmill design plus available SteadyType™ keyboard trays make for the smoothest typing-while-walking experience, anywhere. Shop iMovR's selection of standard-top treadmill desks, featuring our premium adjustable-height desks paired with the revolutionary ThermoTread GT walking treadmill. Paired with the revolutionary ThermoTread GT Office Treadmill, the iMovR Energize and Cascade Desks make something that once seemed like a dream into an easily-attainable reality: a walking workstation. Whether it's the ThermoTread's quiet motors and LCD touchscreen interface, or the unparalleled customization offered by the Freedom line (over 3400 configurations are possible), iMovR's Freedom Treadmill desks are your gateway to a healthier workday. 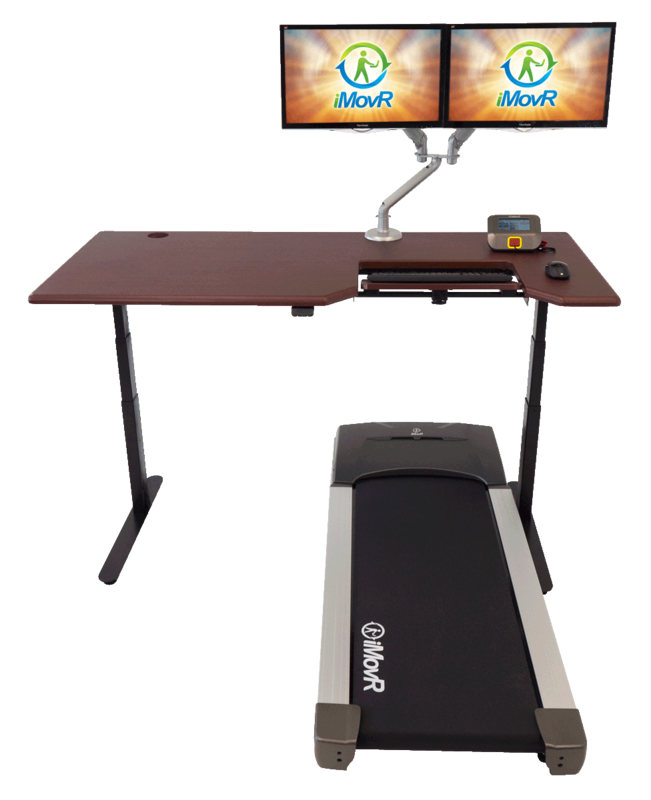 Shop iMovR's selection of treadmill desks featuring built-in, fully adjustable SteadyType keyboard trays. These desks allow you to achieve superior ergonomics when typing while walking or standing. 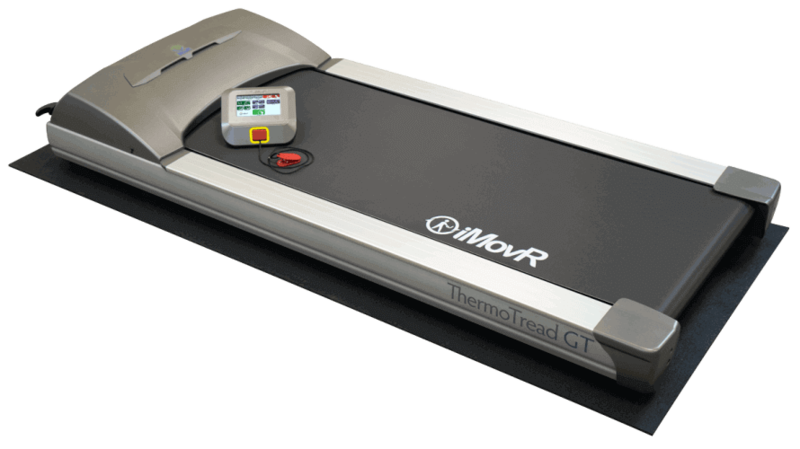 Paired with iMovR's groundbreaking ThermoTread GT walking treadmill. Boost your health, focus, and productivity at work with the ThermoTread GT—the world's first treadmill designed exclusively for the office. The ThermoTread GT is backed by our 100-Day, 100% Satisfaction Guarantee and an industry-leading warranty. The ThermoTread GT is the first treadmill desk base designed from the ground up to live in an office environment, not a gym. Featuring upgraded componentry and a sleek, touch-screen LCD console, the whisper-quiet ThermoTread is engineered to stand up to the heavy stress of continuous use as you walk your way to a healthier workday. The highly configurable Energize™ Standing Desk from iMovR is made in America, featuring premium components at an import price. Enjoy the greater focus, productivity and wellbeing that comes from using a treadmill desk. This bundle includes the the Energize desk and the ThermoTread GT, the world’s first treadmill built from the ground up for office use. 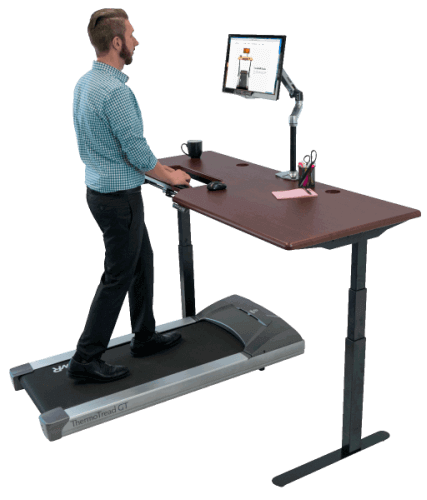 The Lander Treadmill Desk is the most advanced walking workstation there is to date, with high-tech control functions, ease-of-use, and durability that outperforms competing models based on gym treadmills. Enjoy the greater focus, productivity and wellbeing that comes from using a treadmill desk. 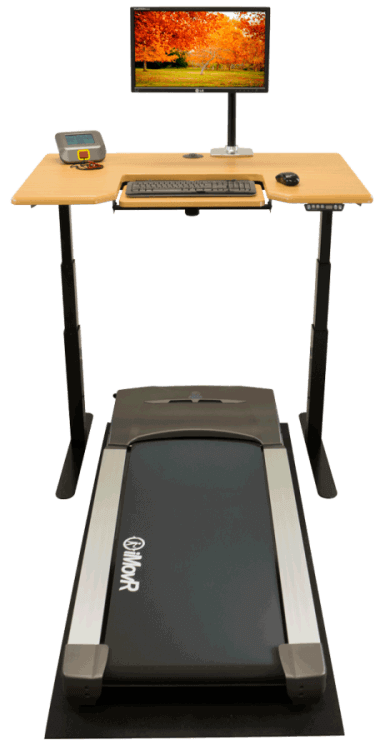 This bundle pairs the Lander Desk with the ThermoTread GT, the first treadmill truly designed for the office. The highly configurable Cascade™ Standing Desk from iMovR is made in America, featuring a SteadyType Keyboard Tray for optimal ergonomics. The key to its cost competitiveness, state-of-the-art quality, and high performance is our exclusive advanced manufacturing technology. Enjoy the greater focus, productivity and wellbeing that comes from using a treadmill desk. This bundle includes the the Cascade standing desk and the ThermoTread GT, the world’s first treadmill built from the ground up for office use. 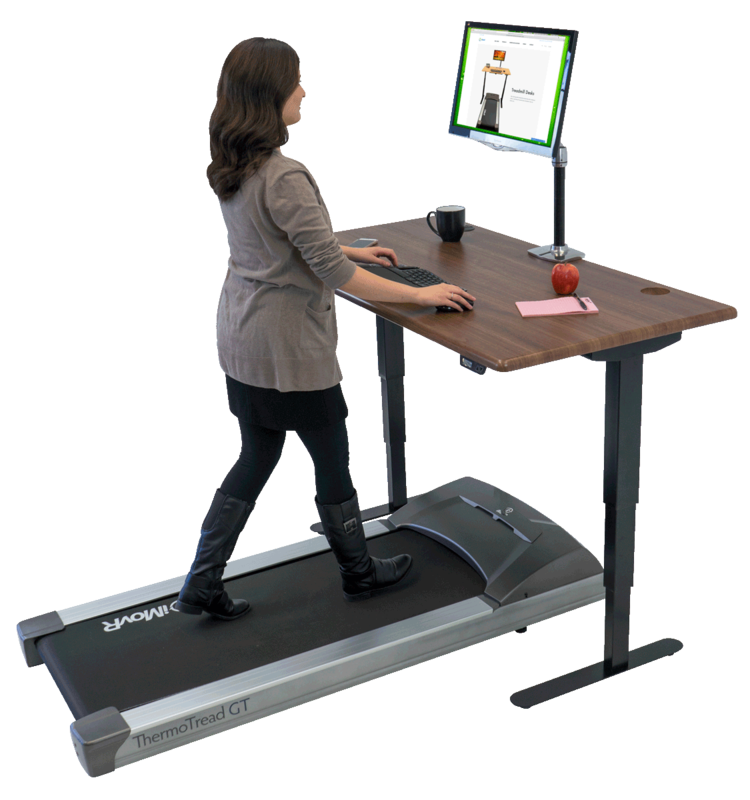 The Lander Treadmill Desk with SteadyType is the most advanced walking workstation there is to date, with high-tech control functions, ease-of-use, and durability that outperforms competing models based on gym treadmills. Enjoy the greater focus, productivity and wellbeing that comes from using a treadmill desk. This bundle includes the Lander Desk with SteadyType and the ThermoTread GT Office Treadmill. An ultra quiet treadmill base, extending legs, and impeccable quality make iMovR treadmill desks superior to their competitors in every way. Our ThermoTread GT is one of the quietest treadmills on the market, which makes it an unobtrusive addition to the office. In fact, it’s the world’s first treadmill designed from the ground up specifically for office use. It won’t burn out after sustained operation like a running (gym) treadmill or a cheaper office treadmill. And it's backed by an industry-leading warranty of 3 years on motor and 2 years on parts. Since the treadmill increases your height, our desks can extend up to 55”, accommodating tall users (above 6’4”). And their 3D-laminated tabletops can withstand dings, scratches, and exposure to harsh chemicals and cleaning agents. What’s more, our desks will fit with a variety of decorating styles thanks to their minimalist modern style regardless whether you’re buying one for home or office. We offer more than a hundred additional color options (available for custom order) in case you need to add extra flair to your interior. Finally, our standing and treadmill desks will soon feature an iMovR cloud station that will help you better allocate wellness program funds or measure your individual progress on calorie burn and miles. Also known as a walking desk or an exercise desk, a treadmill desk is an expensive and complex piece of equipment that you can DIY as long as you choose the right components. If you’re a standing desk user who wants to take your office fitness game to the next level, try iMovR’s state-of-the-art treadmill base. Simply place it under your standing desk, plug it in, and start walking while working. Please note, that a treadmill will add a few inches to your height, so you have to make sure your standing desk can accommodate that. If you own one of iMovR standing desks you can buy our height extenders to bring your treadmill desk up to 55” height. Our experts are here to help you make the right choice for your specific situation—call us at 888-208-6770 or start an online chat with a live product specialist.